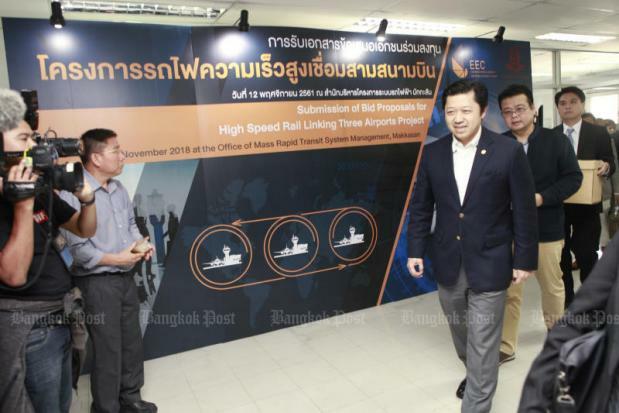 Charoen Pokphand chief executive Suphachai Chearavanont leads his team to submit a bid for a high-speed train project connecting Suvarnabhumi, Don Mueang and U-Tapao airports on Nov 11, 2018. A Charoen Pokphand Group (CP)-led consortium has offered the lowest bid for the high-speed railway project connecting three major airports, State Railway of Thailand (SRT) acting governor Worawut Mala said on Friday. However, the committee was still considering the state subsidy request proposed by the group. The government has set the state subsidy for the project at 119 billion baht. The committee has asked the CP-led group for additional details regarding its subsidy request. The group will provide an answer next week before the committee decides on the bid winner, Mr Worawut said. He was speaking after a committee overseeing the bidding for the project spent more than nine hours considering bid proposals submitted by the two qualified bidders. On Tuesday, the SRT opened the bid envelopes containing financial proposals for the project to link Don Mueang airport in Bangkok, Suvarnabhumi airport in Samut Prakan and U-Tapao airport in Rayong. An SRT source said that the committee was waiting for information from a project consultant regarding the proposals. The committee comprises Mr Worawut, SRT deputy governor Sujit Chou-sirikool, and representatives from the Transport Ministry, the Office of the Attorney-General (OAG), the Budget Bureau, the Finance Ministry and a committee overseeing the development of the Eastern Economic Corridor. The bidder offering the lowest price will be invited for talks and a contract drafted and sent to the OAG for examination. According to the SRT, only two groups were qualified to contest the contract, based on their technical qualifications and track record. They are BSR Joint Venture and the CP-led consortium. BSR is made up of Bangkok Mass Transit System Plc (BTSC), Sino-Thai Engineering and Construction Plc (STEC) and Ratchaburi Electricity Generating Holding Plc (RATCH). BTSC currently operates the Skytrain in Bangkok. Its Phaya Thai station is linked to the 29-kilometre Airport Rail Link which connects the capital with Suvarnabhumi airport. The other contenders consists of CP, Bangkok Expressway and Metro Plc (BEM), China Railway Construction Corporation Ltd (CRCC), Ch Karnchang Plc (CK) and Italian-Thai Development Plc (ITD). BEM is the operator of a subway connecting Hua Lamphong with Bang Sue in Bangkok. Its Phetchaburi station is also a stop on the Airport Rail Link. The 220-km-long high-speed railway network is scheduled to open in 2024.Its trains are expected to be able to reach up to 250 kilometres per hour.The project was fast-tracked as part of plans to develop the Eastern Economic Corridor. The high-speed rail project linking the three airports makes use of existing structures and routes, as well as two new connecting routes.